Christmas Day itself may have passed, but today as in past centuries the Christmas season continues. In Shakespeare’s time the Christmas period was marked by more home-grown traditions including the burning of the yule log, rural sports, feasting and misrule. In his 1661 publication Twelve Moneths, Matthew Stevenson referred to it as “England’s twelve dayes madness”. 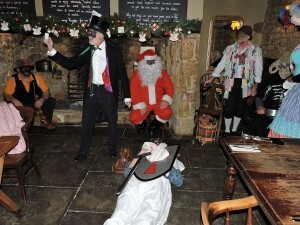 One of the more eccentric customs is mumming, and on Boxing Day we went to the village of Ilmington in Warwickshire where the Ilmington Morris Men were performing their mumming play at both the pubs, The Howard Arms, where all our photographs and video were taken, and the Red Lion. “The typical Mummers’ Play opens with a naïve induction in which one of the performers craves the spectators’ indulgence, asks for room, and promises a fine performance. When this is concluded the two protagonists appear, and after each has boasted of his valour they fall to fighting. In this duel one or other is wounded or killed. A doctor is then summoned who vaunts his proficiency in medicine and proceeds to revive the fallen hero…It is now the turn of minor characters to enter and provide irrelevant amusement of a simple sort. One of them collects money and the performance finishes with a song”. These characters often include the Doctor’s man, Beelzebub, a man-woman, and Father Christmas. Part of the tradition of these ritual plays is that the participants should be disguised, with blackened or masked faces. 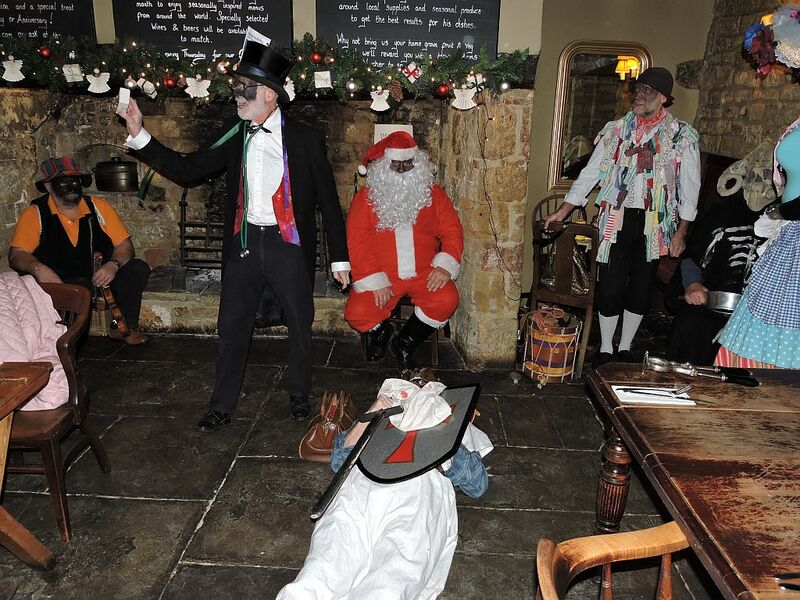 It’s easy to see why these plays with their themes of the battle between good and evil, death and rebirth, have evolved to be performed at the winter solstice, and the Ilmington Mummers Play follows this pattern. Mr Tiddy was a lecturer in English and Classical Literature at Oxford University, so in his study he tried to make connections between the plays and earlier works such as the medieval morality play Mankind. He wrote “That there was a certain amount of contact between the folk play and drama of a more literary kind is proved by certain cases of borrowing…It is for the most part quite uncertain whether the folk borrowed from the literary playwrights or the literary playwrights from the folk.” However his suggestion that the borrowing was mutual is now thought to be wishful thinking, as with no evidence for the mumming plays as such existing before the mid-1700s, all the borrowing was on the part of the folk plays. “if you chance to be pinched with the colic, you make faces like mummers”. Morris dancing features in several plays including The Two Noble Kinsmen (part-authored by Shakespeare) and The Shoemaker’s Holiday by Dekker, which the RSC is currently performing. D R Pye described how he and Tiddy performed as morris men in an OUDS production of The Shoemaker’s Holiday. “The affair proved indeed a triumphant success, and our “side” was doubly encored at each performance”. Tiddy noted that Shakespeare incorporated the spirit of mumming into several of his plays, particularly As You Like It, and it’s certainly tempting to see the mumming tradition in the mechanicals’ play in A Midsummer Night’s Dream, where “hard-handed men” men perform their play, prompting Hippolyta’s observation that “this is the silliest stuff that ever I heard”. R J E Tiddy came from Oxfordshire and lived in the village of Ascott-under-Wychwood. He knew Cecil Sharp well, and became fascinated by folk drama, in particular the mumming plays. He began researching the plays in 1913, collecting many of them personally, and the five lectures he gave on them in Oxford in Spring 1914 were eventually published in The Mummers’ Play. Tiddy also had connections with Stratford-upon-Avon, where there were strong links between folk song and dance and the Shakespeare Festivals. D R Pye’s Memoir in the book notes “The Annual Summer School of the English Folk Dance Society had been arranged to be held at Stratford-on-Avon in August… . Tiddy had for some years taken an enthusiastic part in these gatherings, and had performed in the weekly demonstrations of Morris and country dances that were held in the grounds of the Shakespeare Memorial Theatre. More than once, too, he had lectured on the Dances and Folk songs which made up the programme”. After the outbreak of war in August 1914 Tiddy applied to join the army, but was repeatedly rejected for Foreign Service, being both extremely short-sighted and asthmatic. 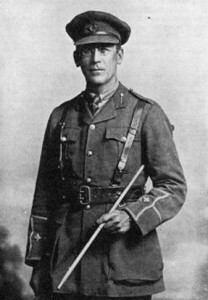 He was later accepted, becoming a Second Lieutenant with the Oxfordshire and Buckinghamshire Light Infantry, posted to France in the middle of May 1916, and killed in action on 10 August 1916, just three months later. After the war, colleagues, friends and pupils published his book, which has since become a key work for researchers in the subject. There is an article about him on the Master Mummers website. 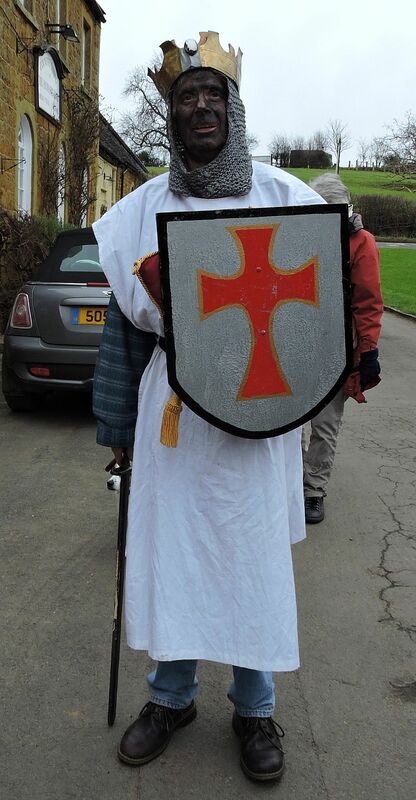 After the war the folk traditions of mumming and morris dancing declined. Many of the participants had died in the war, and the world seemed to have moved on. Tiddy’s book, though, remained, and when interest in folk traditions revived later in the twentieth century it was possible to reconstruct them. It’s a tribute to R J E Tiddy that there are now over three hundred groups listed on the Master Mummers list of groups. Using Peter Millington’s list we had a choice of where to go to see a mummers play. Thanks also to Peter for identifying the location of our painting of a mummers play as the Greyhound pub in Overton, Hampshire where the play, transcribed by R J E Tiddy, is still performed. Photographs and video taken by Richard Morris and Charles Tompkins. 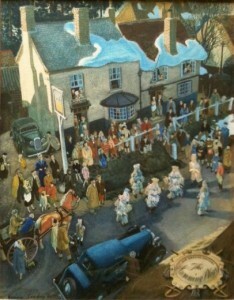 This entry was posted in Legacy, Shakespeare's World, Stratford-upon-Avon and tagged Boxing Day, Christmas, English Folk Dance and Song Society, folklore, Ilmington, Ilmington Morris Men, Master Mummers, Mumming, Overton, Peter Millington, R J E Tiddy, The Howard Arms, The Mummers' Play, Warwickshire. Bookmark the permalink.